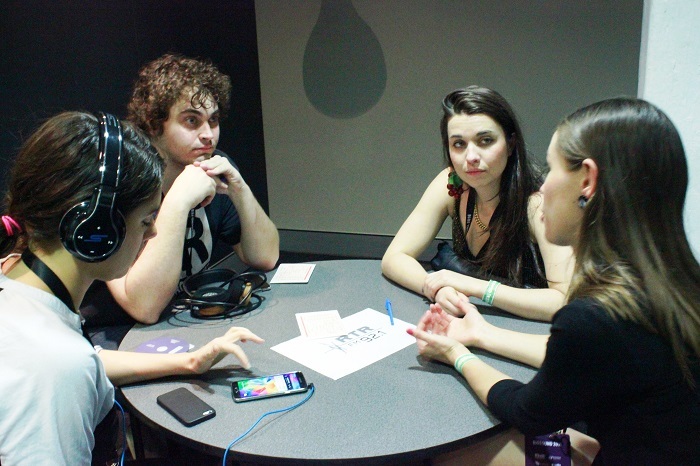 In early September, the CBAA's Amrap invited a troupe of community radio Music Directors and station staff to Brisbane for the annual BIGSOUND music industry conference. 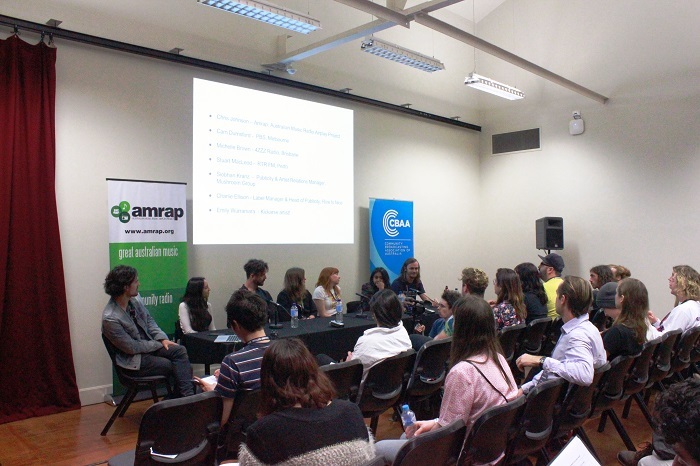 During the jam-packed 3 days of workshops, panels, live music showcases and sessions, Amrap provided delegates with important opportunities to forge closer connections with community radio. Each night, BIGSOUND's 1,300 strong delegate list of musicians, artist representatives and international guests were entertained by over 150 showcasing musicians across 15 venues in Brisbane's Fortitude Valley. A staggering 90% of showcasing acts have added their tracks to Amrap's music distribution service AirIt, and 82% put a release on AirIt in the last 12 months, ensuring that community radio were amongst the first to get their newest singles for airplay. Amrap coordinated listening sessions at BIGSOUND which gave artists the opportunity to pitch releases to community radio Music Directors and learn more about how stations support Australian music on-air and online. Over 30 musicians and artist reps booked out 96 fifteen minute one-on-one slots with Music Directors from Triple R, FBi Radio, 2ser, PBS FM and RTRFM's recently appointed music team. The Future of Your Music On Community Radio panel provided tips and insights to a packed room of over 70 BIGSOUND delegates. Facilitated by Amrap, the panel included an all-star cast of music industry experts and radio personnel; Michelle Brown - outgoing Station Manager at 4ZZZ (Bris), Stu McLeod - General Manager at RTR FM (Per), Cam Durnsford - Music Director at PBS FM (Mel), Siobhan Kranz - National Publicity & Artists Relations Manager at Mushroom Group, Charlie Ellison - Label Manager & Head of Publicity at Rice is Nice and Amrap Chart-topping musician Emily Wurramurra. Emily Wurramurra's impressive rise on community radio formed one of two case studies discussed during the panel. Her second single 'Black Smoke' has been the most ordered track on AirIt in 2016 so far, racking up over 100 orders in its first month and gaining a monumental 11 spots in both the Amrap Metro and Regional Charts. Her EP has been spun on home state stations 4ZZZ, Noosa Community Radio, Fraser Coast FM and across the country on FBi Radio and Koori Radio Sydney, RTR FM Perth, Edge Radio Hobart, Noongar Radio in WA and was a feature record on PBS FM in Melbourne. Emily attributed her success to building relationships with stations on-air and online, whilst taking the time to thank individual program makers for playing her tracks. During the panel, Charlie Ellison from Rice Is Nice stressed the importance of community radio airplay in raising their artist's profiles. The independent Sydney label have had a huge year this year, with releases by Summer Flake, Sarah Mary Chadwick, The Laurels and Rebel Yell making FBi Radio's ADDs lists, Triple R's (Mel) 'Soundscape' and being listed as Feature Records on PBS FM (Mel) and RTR FM (Per). Rice Is Nice tracks airplay through Amrap's Airplay Search, which collates real time results from over 1,000 programs using Amrap Pages to log the songs they play. Charlie encouraged delegates to use their own monthly AirIt reports along with Amrap's Airplay Search to learn more about where their music fits on community radio. In Rice Is Nice's case, Amrap service reports are used to pitch new releases to stations and plan community radio opportunities such as in-studio performances and on-air interviews during national tours. Panel attendees were shown how to use Amrap's Airplay Search, AirIt and the CD Mailout to grow their audiences on community radio and develop relationships with stations, helped along with way with some pro marketing tips from Mushroom Group's Siobhan Kranz. 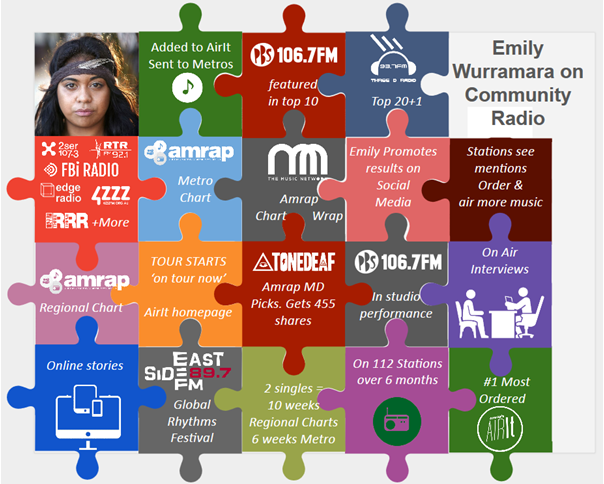 IMAGES: Top - RTR FM's music team with Sydney hip hop duo Coda Conduct, Middle - Panel slide of Emily Wurramara's rise on community radio, Bottom - The Future of Your Music On Community Radio panelists. Photos by Chelsea Deeley & Rowena McGeoch. The Amrap team are heading to Brisbane next week for the annual BIGSOUND music conference and festival. Community radio Music Directors from key metro stations will also be making the trip to take part in Amrap facilitated one-on-one listening sessions with artists and a panel on promoting music to community radio. The BIGSOUND music conference descended on Brisbane in September and featured a packed schedule of panels, meetings and artist showcases. The CBAA and Amrap will be at music industry conference BIGSOUND in Brisbane, leading a panel focused on how community radio empowers Australian artists, music fans, local scenes and culture. Thursday, 10 September, 3.45pm.